2B Umpire Rob Drake ruled Juan Lagares out for leaving his base path in Colorado, ending a Mets' 8th inning threat via double play. With one out and two on (R1, R2), Mets batter Lucas Duda hit a ground ball softly to Rockies third baseman Nolan Arenado, who fielded the grounder as Mets baserunner R2 Lagares passed in front and out of his reach, before throwing to first base in advance of Arenado. This play produced the rare double-call/blarge/sout, albeit for different reasons, as 3B Umpire Carlos Torres ruled Lagares safe on the missed tag attempt, while 2B Umpire Drake ruled Lagares out for illegally avoiding the tag by leaving his base path. We'll get to talking about mechanics later on, but first, here is a rules refresher. Is this distance more than three-feet? Official Baseball Rule 5.09(b)(1) states that any runner is out when, "He runs more than three feet away from his base path to avoid being tagged unless his action is to avoid interference with a fielder fielding a batted ball. A runner’s base path is established when the tag attempt occurs and is a straight line from the runner to the base he is attempting to reach safely." Though we always bring it up, we'll bring it up again for potential first-timers to help clear up any myths: The call is not "out of the baseline," it is "out of the base path." A base LINE is the direct line from base to base—exactly 90 feet, and each succeeding base LINE is constructed perpendicularly to its predecessor. A base PATH, as portrayed in the aforementioned OBR citation, is the straight line from the runner to the base he is attempting to reach, established at the time of the tag attempt. A baseline is only relevant to a runner under one situation: whether a runner attempting to break up a double play leaves the baseline in an attempt to crash the pivot man. That said, back to the Lagares play. 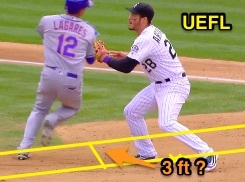 Video analysis indicates that immediately upon fielding the batted ball, third baseman Arenado's first play is an attempt to tag baserunner Lagares; Torres correctly determined that the tag missed. Because we are not privy to a camera view looking straight down the 2B-to-3B baseline (the "high" or "low" third cam), we don't have an angle with which to conclusively judge whether a three-foot deviation from Lagares' base path occurred. We can do our best to piece together the mid-home (live broadcast) and center field camera angles, but even so, our look is inconclusive. For reasons we'll discuss below, Drake's look is much better for answering the base path deviation question. MECHANICS: What IS conclusive, however, is that Torres signaled "safe" and Drake signaled "out." By default, with runners on first and second base (and less than two out), on an infield ball, the third base umpire has all plays going into third. Thus, it would appear 3B Umpire Torres read the play coming his way and ruled on the tag attempt: no tag = safe. 2B Umpire Drake had Ligares' run between the two bases and ruled on it: > 3-feet = out. According to the MLB/WUA Joint Committee on Training, in regards to catch/no catch responsibilities, "A general rule of thumb is for the umpire to whom the glove is opening to take the ball." Specifically, a third base umpire will generally take any ball hit directly at the third baseman or that takes the third baseman to his right, while the second base umpire will take a ball that takes the third baseman to his left. In this fashion, the odd spin of the baseball took F5 Arenado to his left, which opened the play up for 2B Umpire Drake to call after he slid over to gain a parallel look, similar to the two-person crew's button hook technique in taking a BR into second base: the point here is that Drake moved to put himself in optimal position to observe the play. In other words, U2 Drake obtained the so-called keyhole angle: He was in best position to see metaphorical daylight between R2 and F5 AND to see whether R2's run was legal, since the play opened up to him and he was positioned far behind the runner with a wide look. U3 Torres, meanwhile, was closer to the play, but behind the fielder: He was not in optimal position to rule on the runner's legality due to his sharp angle and closed look, but was in optimal position to rule on a play into third base: had Arenado opted to chase Lagares, Torres would have had a great look on a potential tag. As it stands, he was looking Arenado's back; Drake was looking at Arenado's action area (his arms, including left glove hand) as well as Lagares' movement, which is why he was able to confidently rule Lagares out of his base path and convincingly explain the call to Mets Manager Terry Collins.